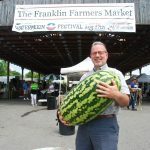 The Franklin Farmers Market hosted its annual Franklin Watermelon Festival on Saturday, August 27th presented by Market sponsor, Williamson Medical Center. 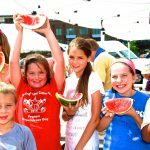 The annual festival grows larger every year, and this year the Franklin Farmers Market had record crowds to celebrate the fruit of summer. 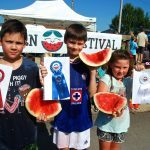 Fun events included a seed spitting contest for adults and kids and a very popular watermelon eating contest for both kids and adults. Other activities included free face painting and games for the whole family. One contest had over 300 entries- the Guess the Weight contest. 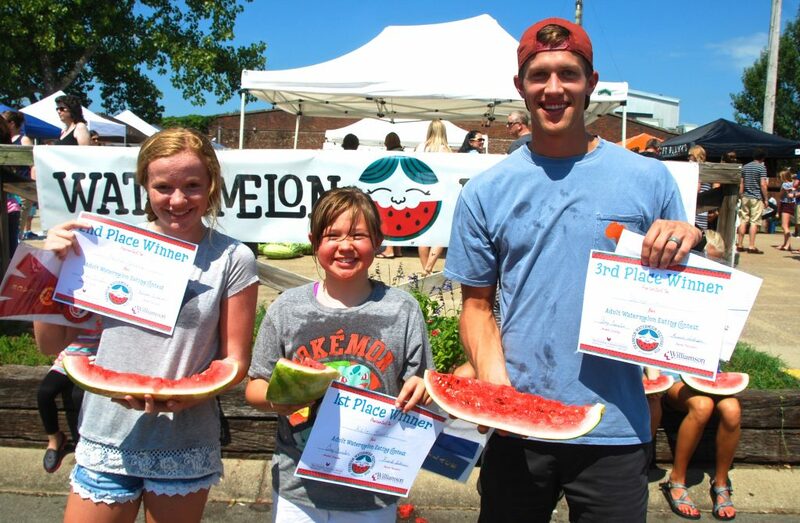 The largest melons at the market, donated by Hollow Creek Farm, came in at 86.3lbs and 74.1lbs. 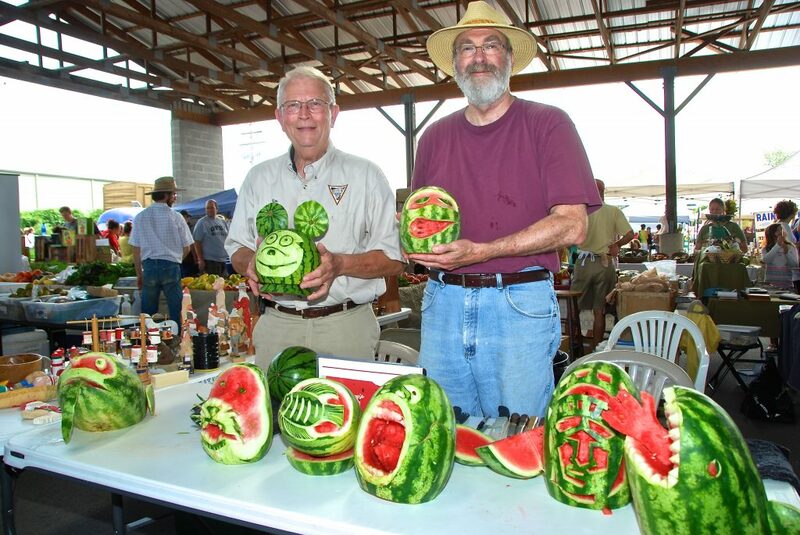 Two lucky customers got to take home the large melons after guessing the weights correctly! 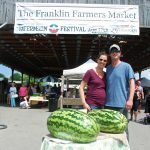 The Franklin Farmers Market vendors and local farmers joined in the fun celebration in their own way. 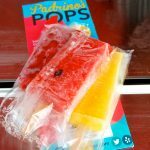 Padrino’s Pops quickly sold out of their famous watermelon pops, and Belle Springs Lemonade wowed the crowd with their handmade watermelon lemonade with melons sourced from the farmers. 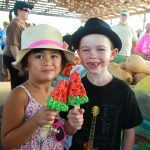 Many of the produce farmers made watermelon creations of their own, including watermelon shaped rice krispie treats at Evan’s Produce and watermelon cake pops at Norton Family Farm. 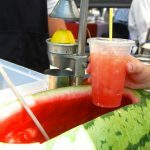 Delvin Farms and Colbert Farm gave hundreds of free watermelon samples to the many customers who attended the festival. 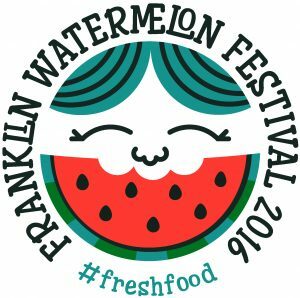 The Franklin Watermelon Festival ends the summer with a bang! 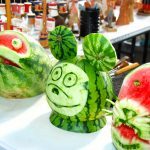 This entry was posted in Market Festivals, Market Saturday News on August 28, 2016 . 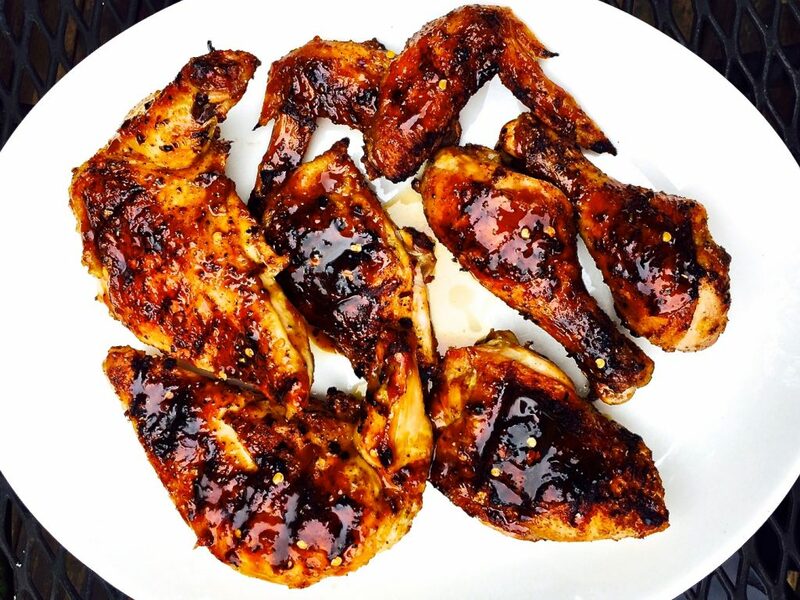 Here’s a favorite honey balsamic grilled chicken recipe you can enjoy for years to come. When it’s too hot to heat up the kitchen in the dog days of Summer we fire up the grill, a lot! 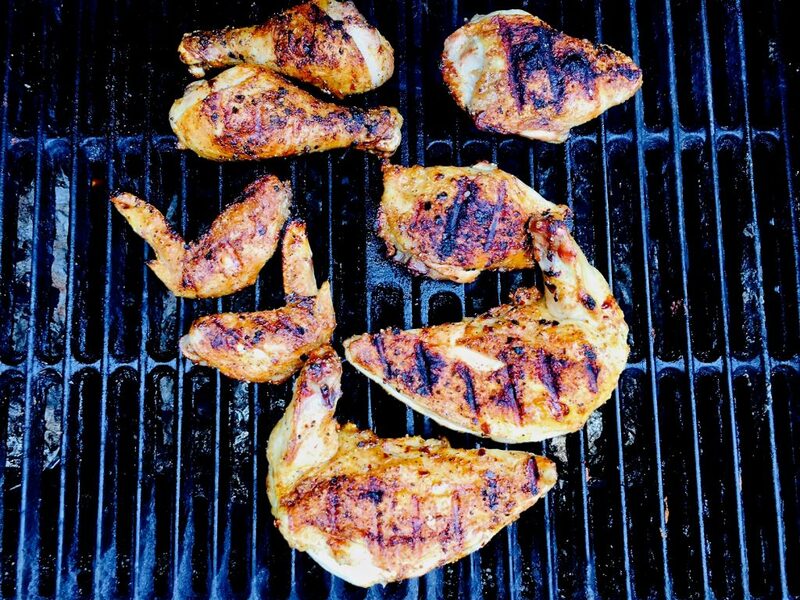 One of my favorite things to grill is locally raised organic chicken from West Wind Farms in Morgan County Tennessee. The flavor is pure, clean and delicious. 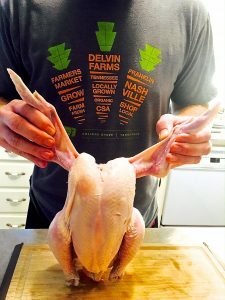 We like to brine the whole bird for a few hours before cutting into serving pieces. 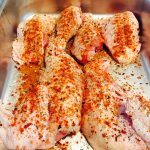 The brining process keep the chicken tender and juicy, and helps to add a a bit of salt to bring out the flavor of this beautiful poultry. 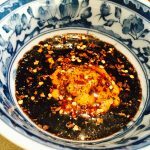 Chances are you can make the BBQ Glaze for items you already have in your pantry. It’s an easy sauce to make but so tasty on this grilled chicken. Give it a try anytime of year. Mix the water and salt together until dissolved in a larger container. Add the chicken and let brine for at least 4 hours. 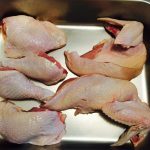 Remove the chicken from the brine and pat dry with paper towels and set aside on a cutting board. Time the wing tips at the second joint, and set aside Remove the breasts by running the knife down the center great bone inch side until you cut through at the wing joint. Set aside with the wings. 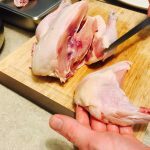 Separate the the thigh quarters and then cut the leg away cutting through at the little fat line that runs between the thigh and leg. 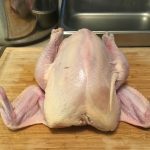 Set aside with the the wings and breasts. Season the chicken with the oil and all of the spices listed above. Cover and let come to room temp for 15 minutes. Now fire up the grill and bring to 450F degrees. When the grill is hot grill the chicken skin side up for about 5 minutes. Tuns the chicken over to grill skin side down for another 5 minutes. At this point you might need to turn down the grill to a more medium heat, and then turn the chicken over agin to skin side up. Using a small soon begin to drizzle the BBQ Glaze over each piece of chicken. Close the grill for a minute and then repeat. Turn the chicken =n over and add more glaze, you will be skin side down now. Close the grill again for a minute to give the BBQ Glaze a chance to work its way into the chicken and slightly begin to caramelize, take care not to burn the skin, a little char is ok but be careful. 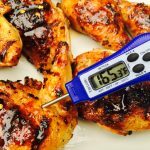 Using an insta-read thermometer check that the temperature has reached 165f degrees (food safety first!). 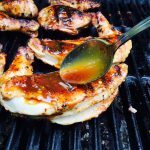 Remove the grilled chicken to a serving platter and drizzle the remaining BBQ Glaze over the chicken. Let rest a few minutes and serve! Enjoy! This sauce couldn’t be easier, basically it’s equal parts local honey, balsamic vinegar and yellow mustard. If you need more then simple scale it up to suit your needs! In a small bowl combine all of the ingredients and mix well. Will keep refrigerated for up to 1 month. This entry was posted in Market Saturday News, Recipes, What's Cooking? on August 19, 2016 . 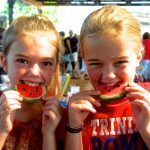 The Franklin Farmers Market will host its 5th annual Franklin Watermelon Festival presented by Williamson Medical Center on Saturday, August 27th from 8am-1pm. This popular event is sure to be the highlight of your weekend as we celebrate summer’s favorite treat. 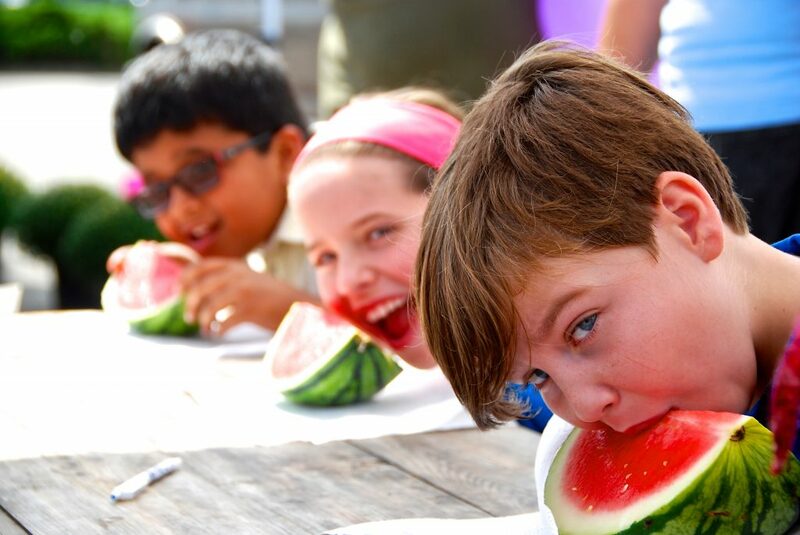 Our local farmers will have the best of their watermelon crops ready for tasting, and customers will have their chance to guess the weight of the largest watermelon ever grown! 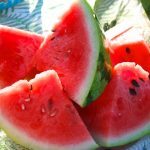 Our produce farmers have carefully tended the watermelons in the field in preparation of this annual event and they tell us that this year is a record year for delicious watermelons! 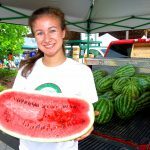 Colbert Farms, Delvin Farms and Kirkview Farm will have watermelons ripe and ready! 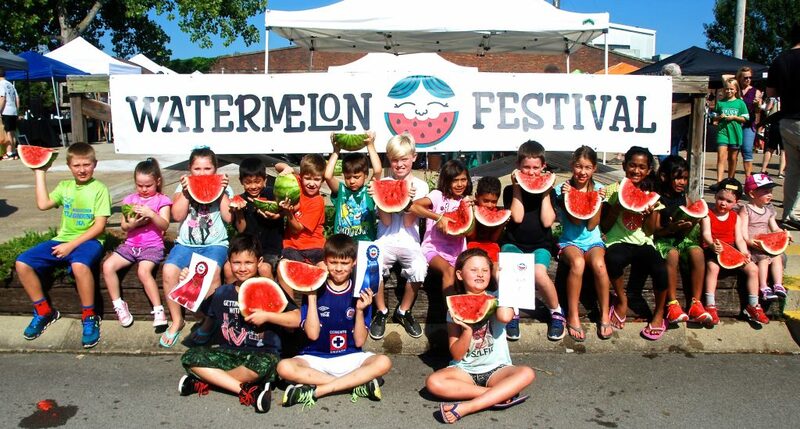 Fun events include a seed spitting contest for adults and kids beginning at 9:30am, watermelon eating contest beginning at 9:30am for kids, 10:30 for adults, 11:30 for kids and 12:15 for adults. There will also be a kids activity area with face painting and games for fun for the whole family! 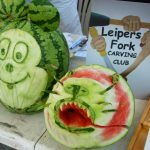 For a special treat, the Leiper’s Fork carving club will be carving beautiful creations from watermelons. Come out to see the amazing artwork and marvel at the unique designs! 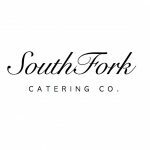 Our vendors and local farmers are joining in the fun celebration in their own way. 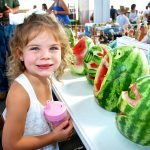 Padrino’s Pops will have watermelon pops, Belle Springs will have watermelon lemonade, Baby Agape will have special watermelon gummies for the kids, Danny’s Donuts will have a special red donut and Crepe Diem will have a watermelon creation that is sure to be superb! 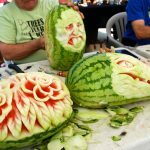 Join us for a fun celebration to see what other vendors have prepared for the Watermelon Festival! 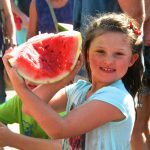 The Franklin Watermelon Festival is more than just celebrating the best of summer. 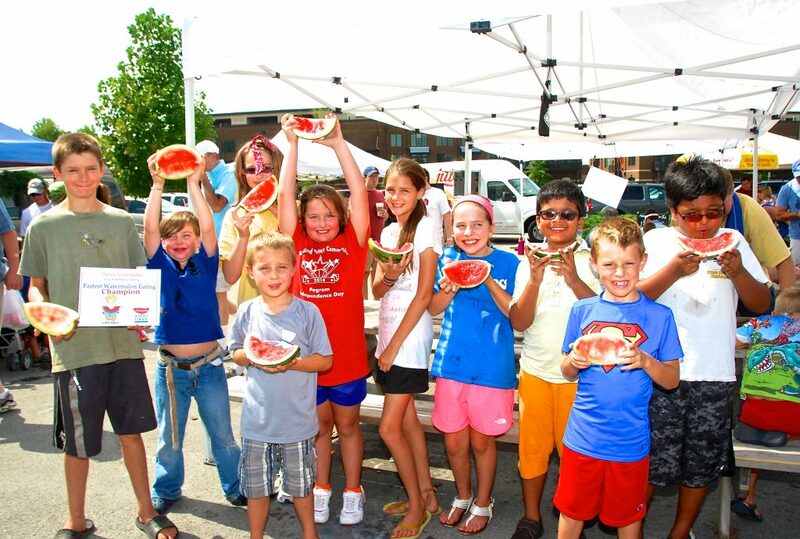 It is a fun, family friendly event celebrating all that is good about our community farmers market! We are grateful for our market sponsor Williamson Medical Center and the impact they have on our community’s healthcare, saving and healing lives everyday. Come join us on Saturday, August 27th for a fun filled day! 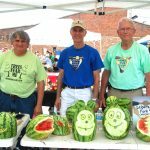 This entry was posted in Market Festivals, Market Saturday News on August 12, 2016 . 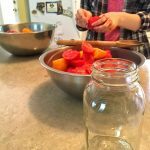 One of my favorite things to do in the summer is to can tomatoes with Romana. 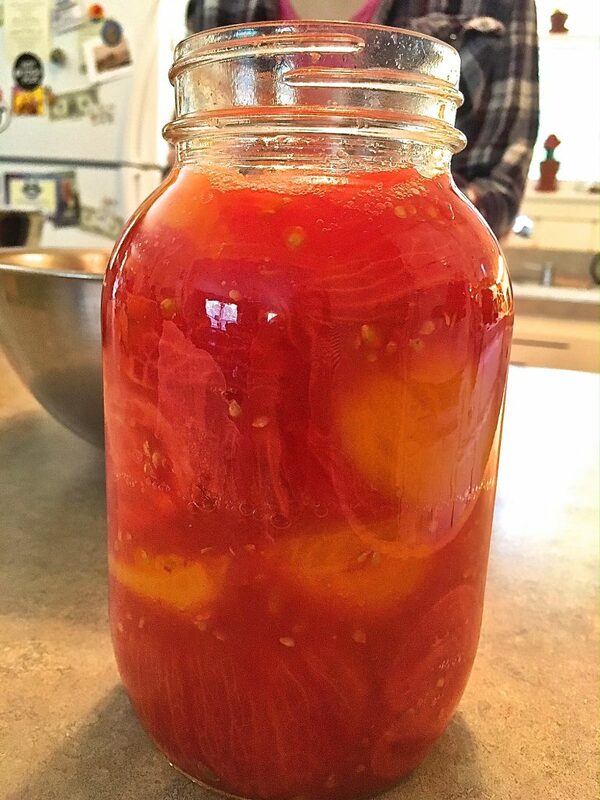 We usually buy 4 or 5 cases of just ripe tomatoes and spend the day “putting up” tomatoes to use in the winter. 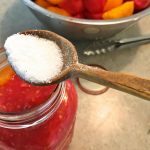 There really is nothing like opening a jar of home canned tomatoes in January and making some rustic tomato sauce to go over pasta with a little grated Parmesan cheese. It’s just like opening a jar of summer sunshine. They also make great gifts! 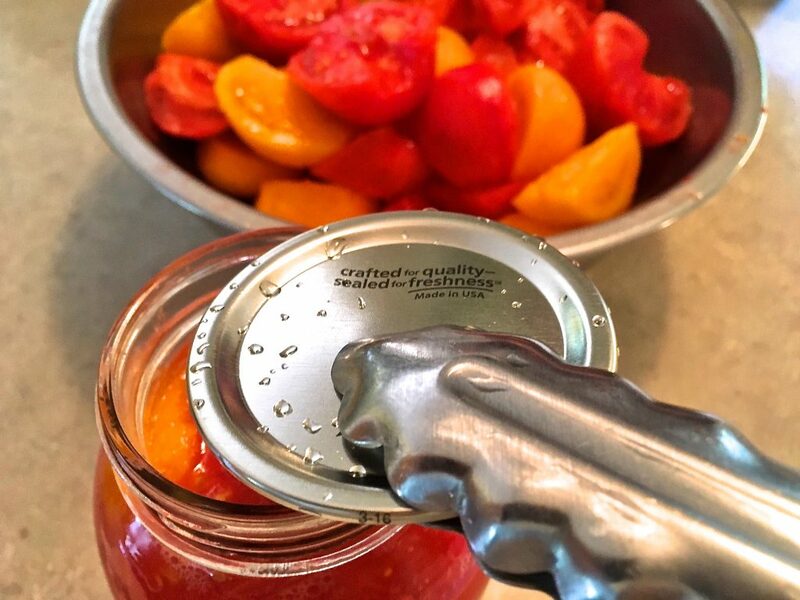 So here’s an easy way to can tomatoes! 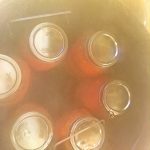 Bring 6 quarts of water to a simmer in an 8 quarts stock pot. 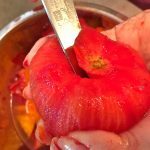 Score a little X in the bottom of each tomato with the tip of a sharp paring knife. 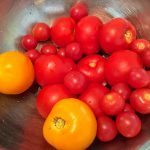 Remove and bits of stem on the tomatoes. 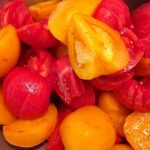 Fill a large bowl with ice and water and set aside to shock chill the tomatoes after blanching. and place on a new clean lid and then close and tighten the ring. Process in a boiling water bath for 45 minutes (35 minutes for pints, if using). 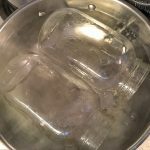 Remove form the water bath using special jar tongs and place on kitchen towels to cool. Lids should seal so there is no movement when pressed. 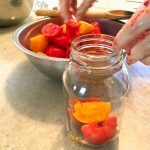 If you have some jars that don’t seal properly you can still use them, but you need to refrigerate them and use them within 2 weeks. Learning how to can tomatoes will deliver some delicious pasta winter meals. Enjoy! This entry was posted in Market Saturday News, Recipes on August 5, 2016 .